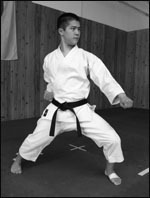 David Pi began his study of karate while attending the University of Chicago. He represented the University of Chicago Shotokan Karate Club in several collegiate tournaments. After graduating from college, Sensei Pi began training with Sensei Sugiyama in Chicago Central Dojo. 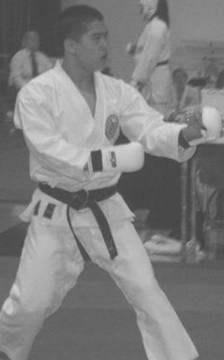 In addition to being an assistant instructor at Peterson Park, he is also an assistant instructor of children's classes at the Sugiyama Dojo and at the University of Chicago where he first began studying karate. In addition to many regional championships, Sensei Pi recently represented the United States at the World Championships held in Poland, where he participated in four events (Kumite, Kata, Fugu-go and En-bu). He works as a consultant in the Health-care industry and plans to attend Law school. He is presently serving in the Peace Corp. Sensei Pi holds a third degree black belt (San-dan).